Revelation instead of obviousness, radical reduction versus reckless verve, ecstatic eternalness, anti-elastic dictatorship of utilization. In the course of an existence amidst the international Techno circus manège that has been running for (in nearly correct mathematical terms) 20 years, Mario Radecki alias Sammy Dee was able to earn an irrevocable aura as an innovator of electronic music workmanship, far away from beaten mass consumption paths and neoteric-commercial validity. As a (former) resident of Berlin based genesis time venues Tresor and Ostgut, the name Sammy Dee has already been notorious for a passionate manifestation of systematic, personality changing mixing skills back in the 90s. Defining an unparalleled audio-arty range, the vinyl fanatic likes to disperse his beliefs and visions eye for an eye, tooth for a tooth to the skilled and listening audience. Through Sammy's audiophile and distinctive presence, subtle bass-lines are consistently oscillating alongside psychotic tunes, chopped and edgy explorations float through intangibly grotesque layers - all flawlessly sailing around a mediocre moment of time with a trademark, mischievious Perlon smile. The monthly club night hosted and curated by Sammy, "...GET PERLONIZED! ", at infamous Panorama Bar, is anno 2011 one of the most prestigious club events Europe-wide. It has a certain illuminating power up it's sleeve, that can not be gained by promotional exuberance or by worshipping at the alter of capital return; but with musical consistency - keywords that encompass and define everything the Berlin born artist does. Various releases, inter alia in cooperation with Guido Schneider and Heiko Laux for Poker Flat and Kanzleramt respectively, are defining the German maestro's vita. Together with his "confederate in crime" and Perlon co-founder, Zip, Sammy created Pantytec in 1998 – eight letters that stand for an infinite flow of emotions, minimal perfection and properly arranged timelessness. Six publications followed, including one album full of all-pervading anti-labelling named Pony Slaystation. Working together with Bruno Pronsato, the man being described in this biographical text gave birth to Half Hawaii in 2006. To date, three physical liaison results have been manifctured on Perlon, hello?repeat and Diamonds & Pearls. Sammy Dee's youngest child is named Ultrastretch. Titled after the PERLON68-B-side and not to be confused with his regular party series at Berlin based Weekend club, Sammy founded Ultrastretch at the end of 2010 with a collective of like-minded musicians and cultivated artists who were ready to walk with him on his underground community based path into a non-genre-focussed and cross-benched/forthright future. Release #1 was realized in January 2011 with Matthew Burton's 'Who Loves You/Small Winner', a Half Hawaii EP is on it's way. 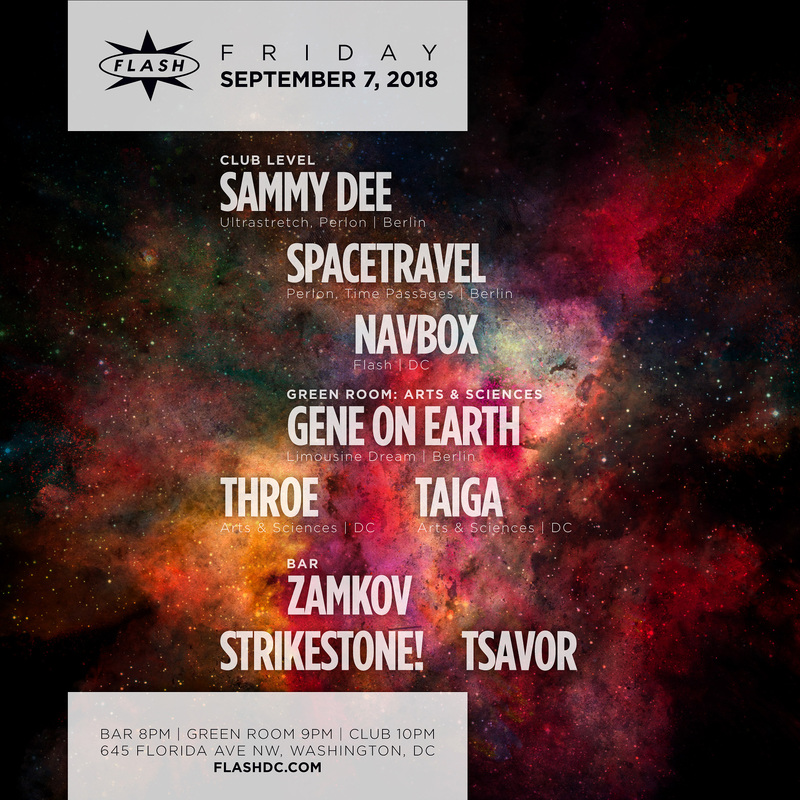 Spacetravel stands out for his picturesque blend of esoterically crafted noises, arranged in complex, fast-paced compositions where vivid acoustic textures, human feel and risk harmonically merge. His productions intersect the frenetic hack-and-slash action and clunking sounds of arcade 8-bit video games, resulting in trianglular sound-waves and nano-loops delivered at the propulsive energy of soul-sonic beeps. It is futuristic electronic music which combines playful house sensibilities with electro organic sounds while imposing an experimental approach which is drily conceptual and warmly immersive. Gene awakens in the hazy sunlight of his own world, heading towards the horizon on the road to everywhere and nowhere all at once. Once a monochrome existence, he’s found himself now submerged in a vivid technicolour dream world. Wherever it leads, he’ll find out soon enough. Throe is the moniker of Washington D.C. based DJ Peter Kaufmann.A long time dance music aficionado, his skills as a selector are supported by a curiosity and plain passion that ignores rigid genre boundaries. A brief run through of past shows confirms this fact. He has served as both headlining talent and as an opener for a diverse array of respected dance music names including Leon Vynehall, Mathias Kaden, George Fitzgerald, Till Von Sein, Bambounou, Jeremy Underground, Jacques Greene, Norm Talley, Pangaea, and many others. With a knack for moving seamlessly between house, techno, and disco, his sets are additionally characterized by free-flowing energy and an organic combination of classic, current, and progressive sounds. He plays regularly throughout the D.C. area, taking control of the decks at globally recognized venues like Flash, U Street Music Hall, Eighteenth Street Lounge, and the Velvet Lounge. In addition to his years of experience DJing, he is the co-founder of #BODYFEEL -- a monthly showcase that has spotlighted cutting edge local & international dance music talent since its inception in 2014. Throe is currently represented by DC based BFF Bookings. Taiga will put a smile on your face.